Microsoft's big-budget marketing campaign supporting its Surface tablets may cost millions, but an analyst says it has helped the company gain some share. NEW YORK (TheStreet) -- Microsoft's (MSFT - Get Report) big marketing push for its Surface tablet -- which has the devices appearing everywhere from the NFL sidelines to CBS' (CBS - Get Report) Hawaii Five-0 -- is bearing fruit, but at a very high cost. Microsoft took quite a bit of heat from industry pundits when it entered the tablet market well after Apple (AAPL - Get Report) and others had established a dominant market share. The latest advertising push, estimated at a cost of $50 million per year by an advertising industry insider, has not made Microsoft a force in the category or even a threat to the major players. But Microsoft is seeing gains. Jim Cramer's charitable trust Action Alerts PLUS owns MSFT. Read his thoughts in the company's recent earnings here. Microsoft's market share among branded tablets is now hovering in the low single-digits, with ABI Research tagging it at around 4%, a half-point increase year over year. IDC was more pessimistic, giving Microsoft 2.5% of the tablet pie for the fourth quarter, when it shipped 1.3 million units. By comparison, Apple and Samsung (SSNLF shipped 21.4 million and 11.1 million tablets, respectively. "In general their marketing push behind the Surface seems to be paying off, as Surface Pro shipments increased substantially this past holiday season," said Jitesh Ubranin, IDC's senior research analyst for Worldwide Quarterly Tablet Tracker. "In terms of share, they have experienced some gains in the commercial market compared to Q4 2013. But it's important to note that the Surface Pro 3 has been very well received in both the consumer and commercial markets." Microsoft is also seeing this improvement on its balance sheet. For the company's second fiscal quarter ended on Dec. 31, the company reported Surface revenue of $1.1 billion, up 24%, driven by the Surface Pro 3 and accessories. Another positive sign for Microsoft is that the Surface Pro 3 is performing well despite a general pullback in the tablet market. Tablet shipments are expected to increase in 2015, but at a much slower pace compared with previous years. 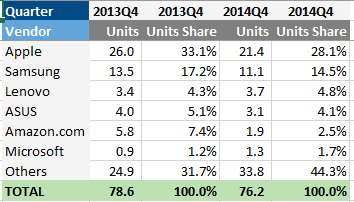 Gartner is calling for an 8% bump in unit shipments for 2015, for a total of 233 million tablets. Gartner cited several factors contributing to this slowdown. First, tablets have a long life expectancy. Instead of simply being used by one person and then replaced, the devices are shared and passed down among family members. Gartner also noted that constant updates to the operating system keep older models current. Finally, tablet makers have not made any big improvements to the hardware itself, and so consumers have fewer reasons to go out and buy a new one. Still, the Surface adds another product to Microsoft's lineup. ABI's Orr said that much like Apple, Microsoft is starting to see some crossover interest between its products with Xbox fans taking a shine to Windows Phone. He thinks that could eventually happen with the Surface. The Surface may not have a huge impact now via its sales, but the tablet's industrial design is forcing its competitors to take notice. "This strategy has certainly paid off, as we now see many tablet and PC vendors offer devices that are just as beautifully designed as the Surface. Even Microsoft's ambition to make pen input more prominent seems to be paying off, as we've seen top brands like Hewlett-Packard (HPQ - Get Report) and Lenovo (LNVGY include some form of pen input in their latest devices announced this year," Ubranin said. While the bounce in shipments is a positive sign, Microsoft is not expected to take on the major players in the category. "We are not likely to see meteoric changes in Microsoft's market share. Apple and Samsung have too much of a lead," Orr said. These small gains have come at a high cost to Microsoft. "ABI's preliminary (tablet) report sees growth and progress for Microsoft," said Josh Orr, senior practice director for ABI Research, adding that the company had to spend "an order of magnitude greater than the other companies because they are late to the party. They have to make their presence known to everyone." There may have been an unexpected consequence of the ads: unrealistic expectations for consumers. By focusing on how the Surface Pro 3 is a laptop killer, specifically a MacBook killer, Microsoft has given the impression that the tablet out of the box can immediately take over as a person's mobile computer. Orr and Ubranin pointed out that this is far from the truth. In fact, several accessories have to be purchased, requiring a significant additional outlay. "Microsoft's marketing campaign around the Surface Pro 3 being a laptop replacement does have its shortfalls. 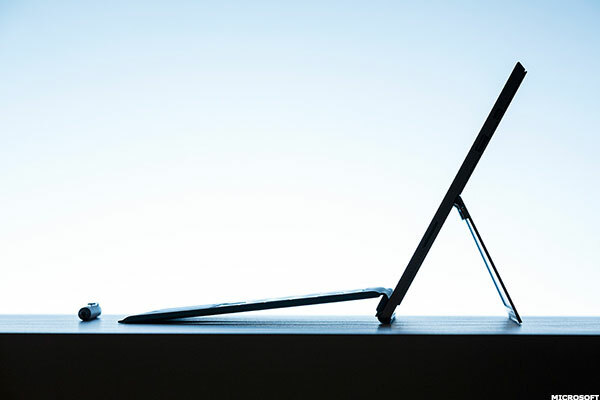 Their decision to not bundle the keyboard has been irksome to many and regardless of how "lapable" a Surface is, it still falls short when comparing to a traditional laptop," Ubranin said. Surface models were all equipped with Windows 8 or 8.1, which adds to Microsoft's tablet headaches, said Orr. The operating system was developed as a touch-centric interface, but it has been such a departure from previous incarnations of Windows that it was not initially well received. "However, the Windows 10 operating system experience is pretty good and should be a plus. The Surface should be the biggest benefactor of the Windows 10 launch," Orr said. Windows 10 is expected to ship sometime this year and will run on computers, phones and tablets.